September 22, 2016 – It’s 7 o’clock and you’ve just walked through the door. Before you’ve even set your keys down, the whole family is asking, “What’s for dinner?” But between working all day, picking up the kiddos from school, taking them to soccer practice, walking the dog and laundry, you’ve completely forgotten about dinner and need something – FAST! No need to worry, you’ve got ALDI. It’s Chef Megan here; ready to cheer you on from the ALDI Test Kitchen! When it comes to quick, filling and healthy, we’ve got you covered with these tried and true 30-minute meals the whole family will enjoy. With a few simple ingredients and a little bit of imagination, any parent can cook like a pro. 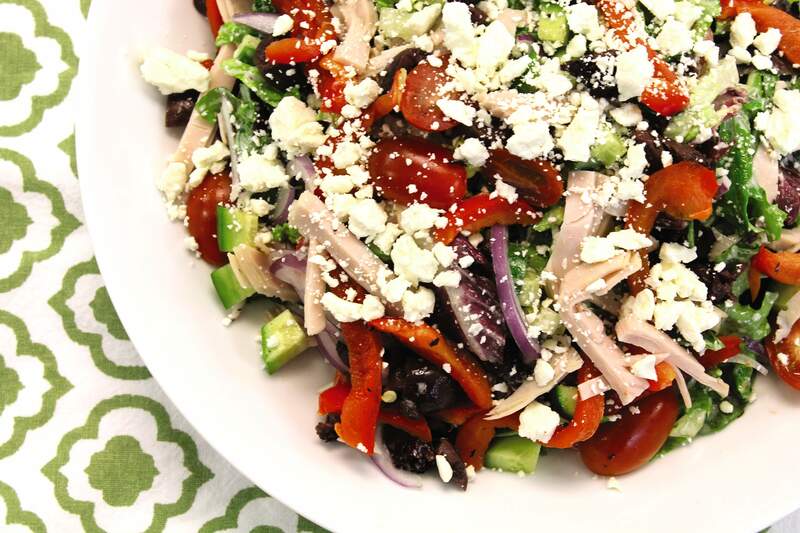 Our Mediterranean Turkey Chopped Salad has a creamy herb dressing you can quickly whisk together using basic kitchen staples. You also get to incorporate a fun chef’s technique when roasting bell peppers over your stove top flame. Your family will be impressed by their new live-in chef! Throw it all together with some SimplyNature Organic Spring Mix, Lunch Mate Never Any! Turkey, a few other fresh ingredients and you’ve got yourself a fiber and protein-packed nutritious dinner in 30 minutes. Be prepared for smiles all around. In the mood for something warm and melted with a bit of crunch? 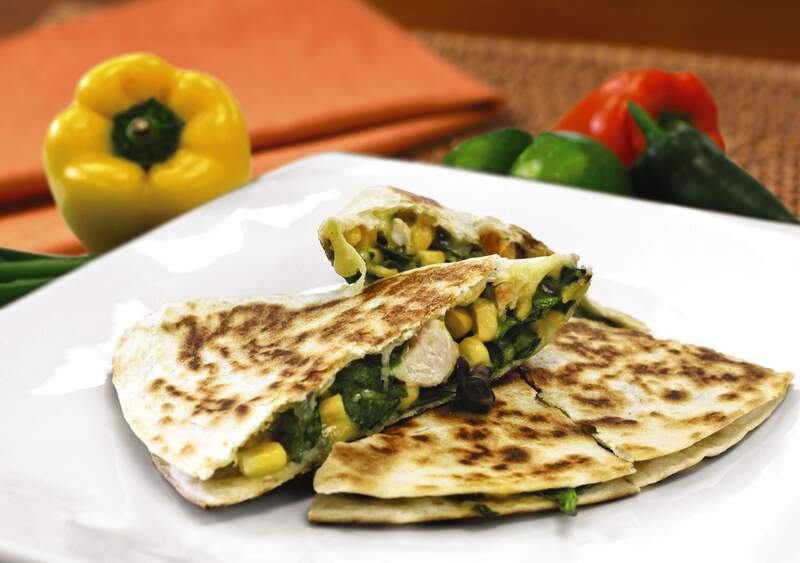 Try this take on a classic, my personal favorite, AND kid-approved recipe, the Southwestern Chicken Quesadilla. It has all the gooey cheese you crave, but also sneaks in some of the nutritious foods that growing children need, like spinach, chicken and black beans. Our Lunch Mate Grilled Chicken Strips are ready-to-serve and can be added into any number of recipes, making them very versatile. Combine the ingredients together in a Pueblo Lindo Burrito Tortilla, sauté until golden brown and in no time at all you’ve got dinner for the whole brood. Not only will your family be full and happy with these recipes, but you’ll feel like you have super powers, having created healthy family meals in 30 minutes or less. So remember not to stress, you’re only a few fresh ingredients and pantry staples away from a new masterpiece. Visit the Recipe section on our website for more great ideas to help you along in future meal-planning adventures. What’s your favorite go-to ALDI item for a quick meal? Share it with us in the comments section below! Chef Megan started her blossoming career at the young age of 5, in her family’s restaurant, where she fell in love with every aspect of food. With her mother’s southern roots and her father’s California style, no recipe was left behind. By 18 she was managing the busiest local deli in Riverside, California. After attending Le Cordon Bleu, Pasadena, she took a post in a fine dining restaurant that provided the catering for local landmarks such as The Fox Theater, Municipal Auditorium, and the Life Arts Center. ALDI has now been her home for 2 years where she has been able to showcase her baking skills and quick homemade meals, and she can’t wait to see the positive impact that it will surely bring to her hometown! I throw rice in the steamer and let it do it’s thing. While that’s going, I like to chop up the nitrite-free (no additive) chicken sausage, zucchini, red onion, fresh mushrooms, asparagus and whole tomatoes and throw them in a skillet with basil pesto and minced garlic. Takes about 10-15 minutes to cook, and you can even add or subtract whatever veggies you want (carrots have to be shredded and potatoes have to be diced into small cubes though). Serve the veggie sausage mix over the rice and top with feta cheese. It’s like a deconstructed Greek shish kabob when I don’t have time to mess with the grill, skewers, and marinating. I should have specified they are whole CHERRY tomatoes. Toss all ingredients ( including vinegarette) serve and enjoy! This program will be in competition with the home delivery programs. Have you thought of adding a delivery service, with meals sized for 1 or 2 persons. There is a large demand for this type of service. I k ow I would be interested. My husband & I have just begun using one of the home delivery programs. So far so good. Can your program be tailored for diabetics, low sodium needs & other special diet needs. Thanks you for this service. I love the refrigerated tortellinis and raviolis! I can use them in cold or hot dishes, they cook super quickly, and my family loves them. The mushroom stuffed ones make a great one pot meal with some diced chicken breast, fresh spinach and alfredo sauce, top with some grated parm and Voilà! Thanks for the 30 minute recipes , the chicken qasadidillas look so good. Tightly fold (like a burrito) about 1/3 cup into a large tortilla and fry in canola oil. Serves at least 8. Serve leftover mixture as a dip with tortilla chips. Cut up beef sausage into medallions toss into skillet. Slice up onion, peppers, and mushrooms add into skillet. When mushrooms look cooked down add in dressing and cheese & simmer for about 5 minutes. Goes well over rice, egg noodles, and have even had it on a baked potato. Always a crowd pleaser. ENJOY!!! I like all ingredients and I’m going to try them and they all sound very tasty and I’ll try any food or ingredients once thank you. Loving your recipes, Megan. So far I haven’t been disappointed in any of the wonderful recipes. And we enjoy shopping at Aldi Foods. Can’t believe the price of eggs or how fresh the cheeses are. Outstanding. Keep up the good work. Thanks for being an ALDI fan Ellen!